Better Than Bouillon chicken base is made from real chicken meat and juices giving it a richer, more robust flavor than ordinary bouillons. 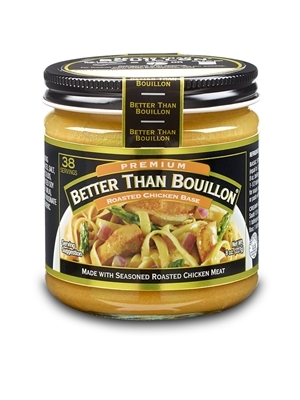 No MSG, no fat and lower sodium -1/3 less salt than ordinary bouillons. Each jar contains 38 one cup servings or enough for 9 1/2 quarts of broth. Also available in a smaller 16 serving size. Dissolve 1 teaspoon (equal to one bouillon cube) chicken base in 8oz boiling water. For each quart of stock needed, use 1 1/2 tablespoons chicken base. Chicken meat including natural chicken juices, salt, sugar, corn syrup solids, chicken fat, hydrolyzed soy protein, dried whey, flavoring, disodium inosinate and guanylate, turmeric. Love this and all flavors made by this company! My favorite for seasoning fresh vegetables. Really gives them a good taste. Difficult to find it locally so I'm glad I found it here!! Like the name says, I agree - it is better than the canned stuff you buy at the stores. And regarding Darlene's comment below, they also make a reduced sodium version! The only bouillon I will use! Superior taste! This product is Great,so much better than those cubes or granules.I used it in soup.It taste like I used real rich homemade broth.